Surfing, casual Friday, hula, our shirts and our ukuleles. Hawaiians shared these freely, so what gives with the 'cease and desist'? Lawrence Downes, a writer and editor in New York, graduated from Damien Memorial High School in Honolulu in 1982. The word means a lot to those of us with Hawaiian roots. So we were upset to hear that a fast-food chain in Chicago called Aloha Poke Co. has been sending letters ordering companies in Hawaii and elsewhere to stop using “aloha” in their names. Aloha Poke sells food in bowls meant to resemble poke, a Hawaiian dish made of raw fish and seaweed and other seasonings. Nobody in Hawaii told these guys they couldn’t do this to our beloved poke, even though they are making it wrong, or that they couldn’t make commercial use of our greatest word. The word is free, of course, and is used by us in a spirit that is open and welcoming to those who want to share. The reaction in Hawaii to the cease-and-desist “aloha” letters has been anger and disbelief. But the trouble, the pilikia, is real. A native-Hawaiian poke-shop owner in Alaska told The Washington Post that after getting the letter, she abandoned the name Aloha Poke Stop and spent thousands of dollars removing “aloha” from her company’s signs, T-shirts and other materials. The company claims it was misunderstood and meant no harm. 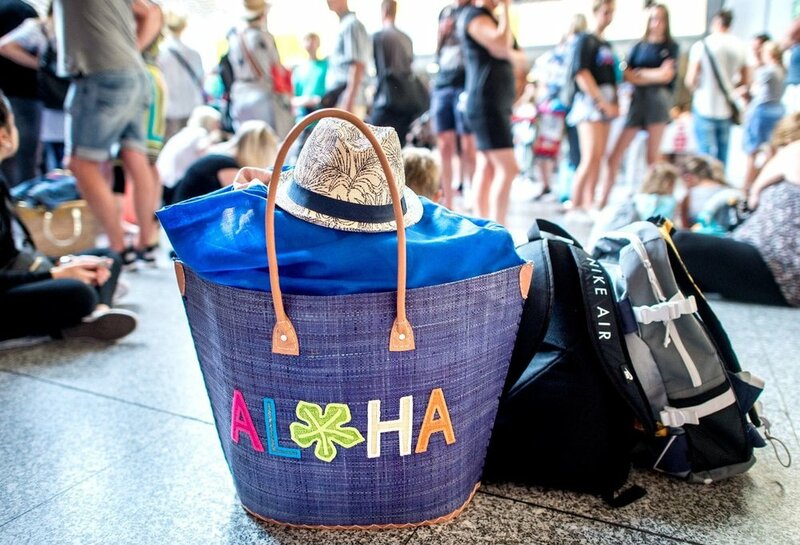 Its claim on the word “aloha’’ is irritating and absurd, but because Aloha Poke chose to go down that road, maybe we should all think about this a little. Maybe we should all reexamine the world’s relationship with Hawaii with an eye to reciprocity and ownership and fair compensation. It’s not that the mainland hasn’t given us things. Christianity, for which many (not all) of us say a heartfelt thank-you. Western diseases and a colonial mind-set, of which we are less appreciative. Spam, which all of us outside our cardiology community love. But the perspective from the islands is that for centuries we have been giving, giving and giving, while the rest of you have been taking, taking and taking. Surfing. You may not realize that your ancestors found ocean waves terrifying. Mark Twain, visiting in 1866, saw islanders surfing and freaked out. We give him credit for trying it, though. People the world over have surf, but only the Hawaiians perfected surfing. It’s ours; please return it and find some other way to have fun in the water. The hula. This is a dance of beauty and grace and spiritual power, a foundation of Hawaiian culture. That thing you do at parties with the plastic leis, grass skirts and flapping arms — could you stop calling it hula, or just stop doing it altogether? The ukulele. This instrument has a European ancestor, the braguinha, brought to the islands by the Portuguese. But we refined it and gave it a new name, meaning “jumping flea,” and we still make the best ones, out of native koa wood, and our Hawaii-born musicians work wonders with them. We are very sorry, mainland hipsters, this isn’t your fault. But we would like our ukes back. The steel guitar. Back when Joseph Kekuku, a country boy from Laie, on Oahu, was a child, he slid a steel bolt along the strings of his guitar, making a lovely sound. He trained himself and others on the new way to play, which spread to the mainland and into honky-tonk history. Please remove the twang from your country-and-western music and return it to us. Cowboys. Speaking of country and western, the idea of men on horseback driving cattle to market — our paniolos did that first, in the 1830s, a few decades before your cowpokes and cowpunchers. If you could please rejigger your movies and rewrite your frontier mythology and have your guys chase those dogies on foot or with ATVs or drones or what-have-you. Thanks. Sugar and pineapple. You liked those, all those years, didn’t you? You’re welcome. “Over the Rainbow,” the soulful version. Go ahead and keep Judy Garland’s song, but we would like Iz Kamakawiwo’ole’s back. His voice is the pure heart of Hawaii that contains all the sorrow and joy and aloha in the world, which is why you can’t stop listening to it. Please stop. Casual Friday and aloha shirts. These floppy floral shirts were invented in Honolulu, as was the practice of wearing them once a week to unstiffen the workplace. Our “aloha Friday” became your “casual Friday,” and “aloha shirts” became “Hawaiian shirts.” You didn’t ask. You have polo shirts and baseball caps; use those. Your superpower status. Who repaired and refloated all but two U.S. warships destroyed in Pearl Harbor in 1941, so that the U.S. Navy could defeat the Japanese empire? Workers in Honolulu did. Where did those Japanese American soldiers brave enough to give their right arms to protect democracy and freedom in Europe come from? You know where. Today you get to sleep well in places like Chicago, knowing that the United States is projecting its military might into the Pacific, the ocean we are in the middle of. Meanwhile, we are the ones who get spooked by reports of North Korean missiles. How fair is that? Racial harmony. When civil rights marchers were being shot in Mississippi, and before the Supreme Court, in the Loving case, struck down bans on interracial marriage, the state of Hawaii was sending its governor to Botswana, a new democracy in southern Africa hemmed in by racist regimes. A Honolulu newspaperman hailed the moment: “The Hawaii-Botswana relationship is a long-range friendship, designed to help the earth resound from pole to pole with one famous cry, ‘Aloha!’ ” Why? The two places are antipodes — exactly opposite each other on the globe — but they had in common a culture of racial harmony and peace. Interracial marriage was truly unremarkable in Hawaii then, and Botswana’s new president, Seretse Khama, was married to a white English woman. That was 1966. What took the rest of you so long? Barack Obama. Are you through with him? A lot of you seem to have moved on. Please send him back to Kailua. The aloha spirit. It’s easy to be cynical if you spend any time in Waikiki. But the spirit of aloha is a real thing in Hawaii. It’s what makes honeymooners all honeymooney; they can sense it in the scented air the moment they get off the plane. It’s what keeps us going, despite our many problems of homelessness, income inequality, environmental ruin, rat-race traffic — the kindness of family and friends, the welcome to strangers, the warm, motley, mixed-up way our immigrant forebears and our Hawaiian host culture have blended. It’s the way we are when we are relaxing with poke and beer and ukuleles at the beach. It’s aloha, and it’s not for sale. I say this with love, affection, compassion, mercy, sympathy, pity, kindness, sentiment, grace and charity. View the article as published on The Washington Post website.